DESCRIPTION An end of terrace family house with good sized accommodation including three spacious bedrooms.The entrance hall leads through to a large living room with patio doors to the rear garden. The kitchen also has direct access to the rear garden. On the first floor, the large bedrooms are all accessed off of the landing. The spacious bathroom also has a shower cubicle. To the outside, the house is approached by a private drive to the front, which leads to an integral garage. 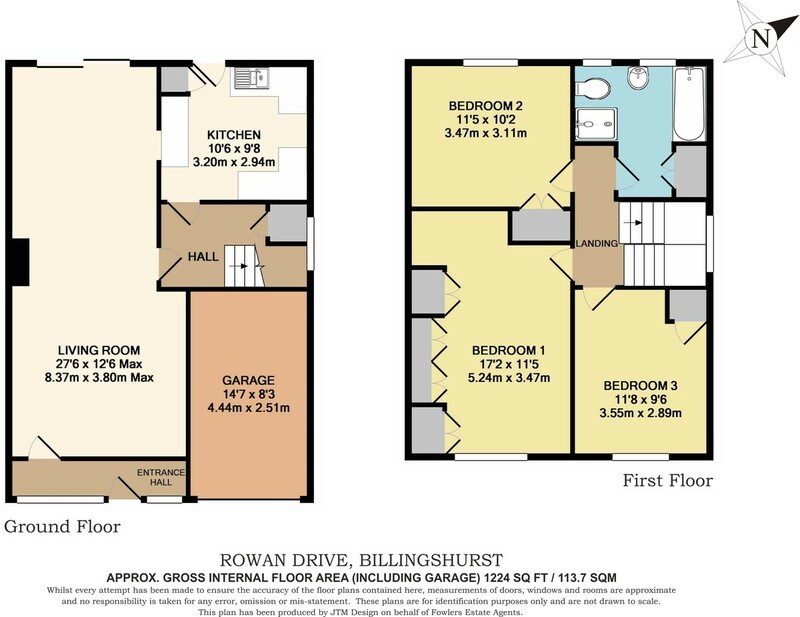 The property is situated on a corner plot and this gives a substantial enclosed and concreted area of ground to the side, which has numerous uses including further parking for additional vehicles including a caravan or boat, plus the option to extend the home further, subject to planning consent. INNER HALL Turning staircase to first floor, picture double glazed window over staircase, understairs storage cupboard, also housing gas boiler. KITCHEN Inset one and a half bowl stainless steel sink unit with mixer tap having base cupboards under, several work surfaces with base cupboards and drawers beneath, space and plumbing for washing machine, range of matching eye-level units, tall larder unit, broom cupboard, space for fridge/freezer, double glazed door with double glazed window to side, radiator. FIRST FLOOR LANDING Access to roof space via pull down loft ladder. BEDROOM ONE Built-in bedroom furniture comprising: two double wardrobes, bedside cabinet with overhead storage above, matching dressing table with further cupboards under, recess housing vanity unit with inset wash hand basin, double glazed window, radiator. BEDROOM TWO Recessed double wardrobe, radiator, double glazed window. BEDROOM THREE Wardrobe, double glazed window, radiator. BATHROOM Suite comprising: panelled bath with twin hand grips, tiled shower cubicle with an electric mixer shower, vanity unit with inset wash hand basin and storage cupboards under, concealed cistern w.c., airing cupboard housing lagged hot water tank, radiator, fully tiled walls, two double glazed windows. SUBSTANTIAL SIDE GROUND Having numerous possibilities including providing additional parking for several vehicles or boat/caravan should it be required but also has the opportunity to extend the property to the side (subject to the usual planning consents). FRONT GARDEN The front garden has a small area of lawn and enclosed on two sides by a Copper Beech hedge. REAR GARDEN Adjacent to the property is a terrace which leads to an area of lawn with flower and shrub borders. To the side of the lawn is a paved patio with flower and shrub borders surrounding. The garden is enclosed by close boarded timber garden fencing.